This article was written by Jenna Goudreau, Forbes Staff, and published in Forbes.com. Imagine a job where you could take as many paid vacation days as you wanted, as long as you got your work done. Even better, imagine your employer offered you a vacation bonus of up to $7,500 to go away awhile and not work at all. Too good to be true? The stuff dreams are made of? In fact, for some workers this is the new normal. More young companies like Netflix, Evernote, Zynga and FullContact are rethinking traditional vacation policies. Some are cutting through bureaucracy and offering employees the autonomy to decide how much vacation time is right for them. Others, fearing employee burnout, are incentivizing relaxation by offering vacation spending money to encourage employees to truly rest and unplug. A recent survey conducted by Harris Interactive of over 2,500 adults working in major U.S. cities found that 57% of salaried workers don’t take all of their allotted time off. Cooper finds this particularly troubling as Americans get less vacation time than most other nations. Employers in France, Italy, Germany and Brazil are required to provide workers 35 to 40 days off a year, but the U.S. has no minimum and companies provide an average of just two weeks. Yet, ironically, the more you work, the less you get done. According to Cooper, research shows that if you consistently work more than 40 hours a week and don’t take vacation, you become ill, your family is negatively impacted and your productivity goes down. These are some of the reasons why Phil Libin, chief executive of archiving technology provider Evernote, is experimenting with vacation policies for his 210 employees. Last year, when he got wind of Netflix’s innovative idea to offer employees unlimited paid vacation time, it immediately clicked. He implemented it at Evernote the next day. In practice, employees can take as much time off as they want—it isn’t tracked by management—and are held responsible only for their performance. More recently, Libin decided that unlimited time off wasn’t enough; people were still working around the clock. He needed to make a more powerful statement. To signal that vacation was truly encouraged by the company, Evernote began offering employees $1,000 spending money once a year to take at least a full week off at a time. Just like the company offers transportation, food and housecleaning services to help employees focus on the job, the vacation stipend is another method to ease employee stress and cultivate their best work. 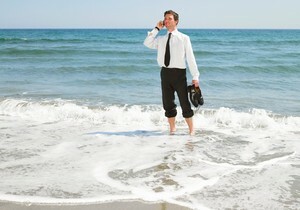 However, research shows that simply taking vacation won’t automatically reduce stress. In a recent survey of 1,000 U.S. workers by leadership development and training company Fierce, nearly 60% said taking a vacation doesn’t relieve their stress, and more than a quarter said they’re evenmore stressed when they return to work. Many admitted to checking emails and taking phone calls while away, sometimes multiple times a day. Bart Lorang, chief executive of FullContact, which provides cloud-based contact management for individuals and businesses, noticed that his employees were working even when they were on vacation. Instead of coming back recharged, they were fried. FullContact now offers “paid paid vacation” to its 18 (and counting) employees. Once a year, each staff member gets a whopping $7,500—enough for a family of four to travel somewhere tropical—to go away. Lorang says it reinforces the importance of resting, while also reducing the stress of spending lots of money to travel. The cash does come with stipulations: Employees have to really take a vacation, they must completely disconnect from technology, and they aren’t allowed to work while away. “People come back so much more refreshed,” says Lorang.